A new study into Australian attitudes towards privacy in the online world has revealed huge concerns exist around how Australians’ personal data is used online. According to the study, by Roy Morgan Research, 90 per cent of Australians say it is unacceptable (either somewhat or very unacceptable) for companies to collect personal financial data, to scrape the contents of messages or emails, or to collect health and medical data for the purpose of tailoring ads and offers to consumers. Less than five per cent deem these practices acceptable (either very or somewhat acceptable). However, despite these concerns only around 15 per cent of Australians claim to ‘always’ or ‘often’ read terms and conditions when signing up for online services and a majority of over 54 per cent rarely or never read them. 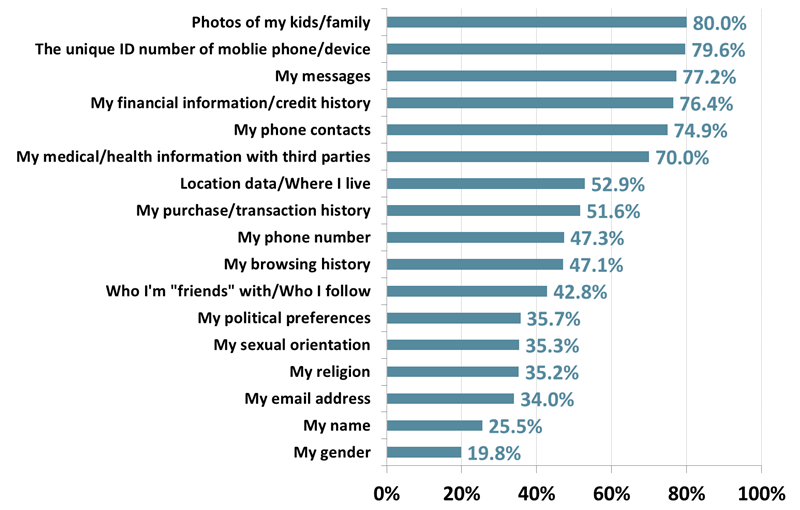 Asked for their views about organisations sharing different types of data and information with third parties 80 per cent of Australians agree they would never want ‘Photos of my kids/family’ shared with third parties – higher than any other type of data or information. At least 70 per cent of Australians agreed they would never want the following types of data shared with third parties: ‘The unique ID number of mobile phone/device’, ‘My messages’, ‘My financial information/credit history’, ‘My phone contacts’ and ‘My medical/health information with third parties’. Australians are far more relaxed about organisations sharing data related to their gender or name with third parties and only around a quarter of Australians say they would ‘never want this data shared’. Commenting on the study, Roy Morgan CEO Michele Levine said: “The results of this in-depth study into privacy concerns shows that huge majorities of Australians would never want photos of their kids/family, private messages, financial information/credit history, phone contacts, medical/health information or the unique ID number of their mobile phone shared with third parties. “Even larger majorities of Australians approaching 90 per cent say it is at least somewhat unacceptable for these types of data to be used for the purpose of tailoring ads and offers to consumers. This is a core facet of the business model of many social media companies that boast about their ability to target ads to consumers based upon the huge amounts of data they collect on consumers.